Do you have a favorite brand(s)? A brand you want to try more products from or learn more about? I know I do. Whether it's a brand that's been loved for years or one that's just recently discovered, there are tons of brands on the market just waiting to be explored. And, sometimes, the best way to try out a brand and its products is through Brand Boxes. There has been tons of Brand Boxes from different companies in the past, like the Leaders Mask box where I discovered some of my favorite masks and the Cosrx Box that had all the products from Cosrx that I wanted to try. So, when I learned that Wishtrend was planning to start a Brand Package series featuring various brands I was super excited for it. To kick off the Brand Package Series, Wishtrend is starting with one of their favorite brands, Klairs. The Klairs Deep Cleansing Package has just been released and we are going to get to know all the products in it! The set also comes with an information card that shares about each product and the step by step order they are used in. Plus it features a free gift, the Klairs Toner Mate 2 in 1 Cotton Pad, that has yet to be released. 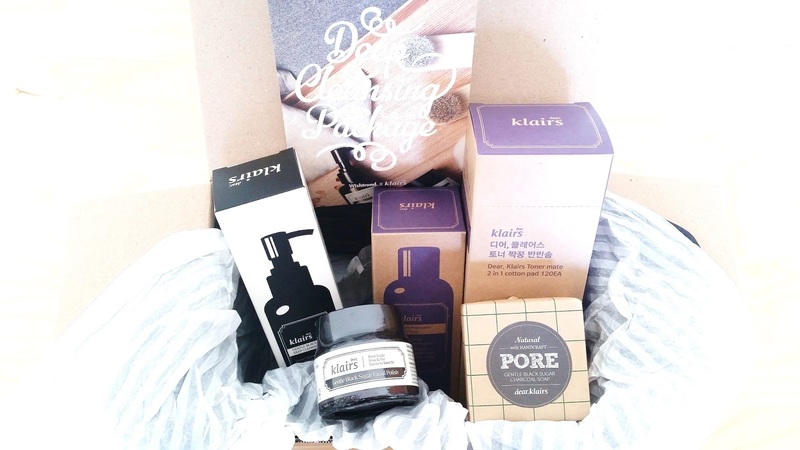 I was super excited about this package because it features one of my current favorites, some products from Klairs that I want to try, and a product that I was always unsure about. The Deep Cleansing package features 2 kits. The cleansing kit and the toning kit. 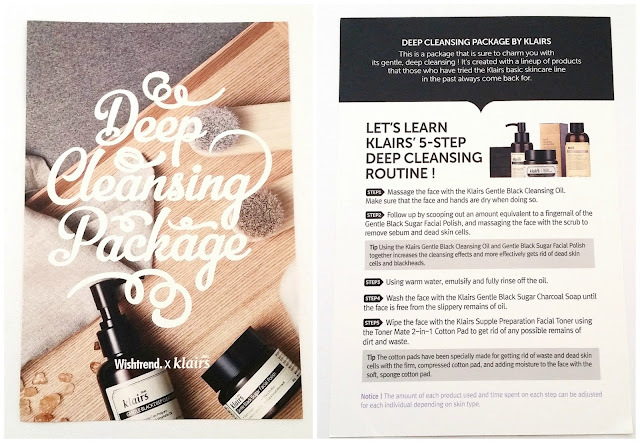 The cleansing kit includes the 3 cleansing products which are the Klairs Gentle Black Sugar Charcoal Soap, the Klairs Gentle Black Deep Cleansing Oil, and the Klairs Gentle Black Sugar Facial Polish. They work together to cleanse the pores, clear blackheads, remove dead skin cells and excess sebum. 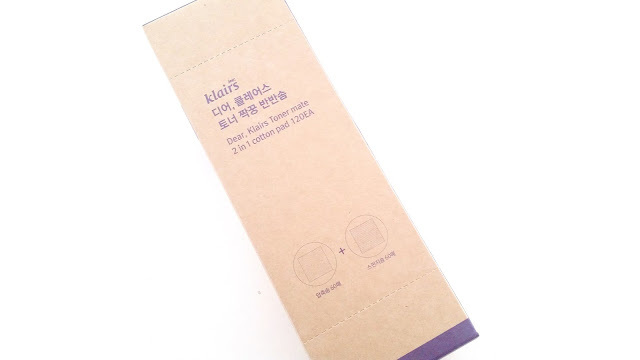 The toning kit includes the Klairs Supple Preparation Facial Toner and the Klairs Toner Mate 2 in 1 Cotton Pad, which are meant to be used together. The box of cotton pads aren't just any old cotton pads, instead the box actually contains 2 different types of cotton pads. Yup, you read right, 2 types of cotton pads and they are the compressed cotton pads and the sponge cotton pads. (The box contains 60 of each type.) The 2 types of cotton pads might seem simple, but combined with the toner they can perform in 2 different ways which is either to clean or tone the skin. With both kits together, it creates a perfect cleansing and toning combo. Now, let's get to know each individual product! Double cleanse is a popular cleansing routine in Asian skincare. If you read DTC often, you've probably seen us mention it a few times. The Double Cleanse routine requires a first cleanser and a second cleanser. Often times, the first cleanser is a cleansing oil of some type. The cleansing oil works to break down oil based makeup, sunscreen, sebum, etc. without causing irritations. Think of them as makeup removers. They can be formulated with various nutritious oils containing vitamins and minerals to provide extra skincare benefits. I actually have this cleansing oil from a previous haul and I have been testing it out for a couple of weeks now. After I ran out of my favorite cleansing sherbet, I dug this out of my stash to test it out. I actually really like it and it's landed itself in my favorites already. I know I haven't review this yet, but I will soon. So be on the look out for it! Product Description: A gentle cleansing oil formulated with natural oils to break down dirt and makeup without causing irritations. It's gentle yet effective and has an easily washable texture as well. The cleansing oil can help to control excess sebum and provide soothing effects to the skin. It can also help to promote cell regeneration as well. To Use: Pump out a good amount (1-3 pumps) of the cleansing oil onto dry hands and apply it onto dry skin. Gently massage over the face to help loosen the makeup and dirt on the skin. After the massage, rinse off with lukewarm water. Follow up with the second step of the Double Cleanse routine. Ingredients: Caprylic/Capric Triglyceride, Cetyl Ethylhexanoate, Isononyl Isononanoate, PEG-7 Glyceryl Cocoate , Isopropyl Myristate, Simmondsia Chinensis (Jojoba) Seed Oil, Glycine Soja (Soybean) Oil, Sesamum Indicum (Sesame) Seed Oil , Ribes Nigrum (Black Currant) Seed Oil , Tocopheryl Acetate , PEG-20 Glyceryl Triisostearate , Polysorbate 20, Fragrance, Butyrospermum Parkii (Shea Butter) , Carapa Guaianensis Seed Oil, Vaccinium Macrocarpon (Cranberry) Seed Oil. The second step of the Double Cleanse routine is generally filled with a gentle cleanser of either gel, liquid, cream, powder, or bar/stick form. There are many types of facial cleansers that can be used in this step, but generally the cleanser is used to help remove the residues the oil cleanser broke down and any other dirt/residues on the skin. The type of second cleanser you use will depend on your skin type. 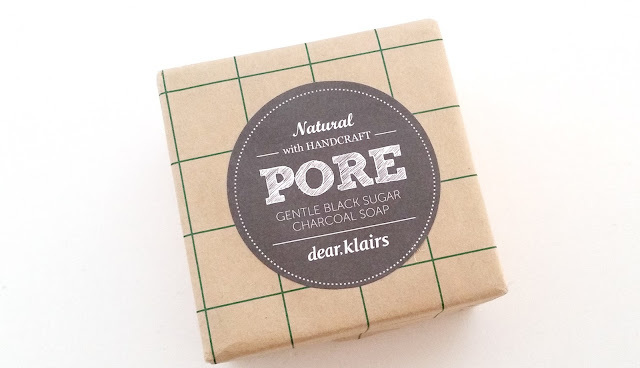 Product Description: The Gentle Black Sugar Charcoal Soap from Klairs is a pore care soap. It contains charcoal which can remove dead skin cells, Ghassoul which can draw out excess sebum, volcanic ash to cleanse out pores and other ingredients to soothe and hydrate the skin. To Use: Lather the soap first, then massage the bubbles all over the face. Finally, rinse off and follow up with your skincare routine. Ingredients: Water, Sodium Hydroxide, Coconut Oil, Palm Oil, Sunfulower Oil, Jojoba Oil, Castor Oil, Olive Oil, Theobroma Cacao(Cocoa)Seed Butter , Grapeseed Oil, Black Strap Powder , Dl-ΑTocoperol, Volanic Ash, Ghassoul, Charcoal, Lavender Oil, Eucalyptus Oil. Exfoliation is an optional step, however, many people do it because it helps to remove dead skin cells and dirt from pores. There are 2 types of exfoliators, physical and chemical. 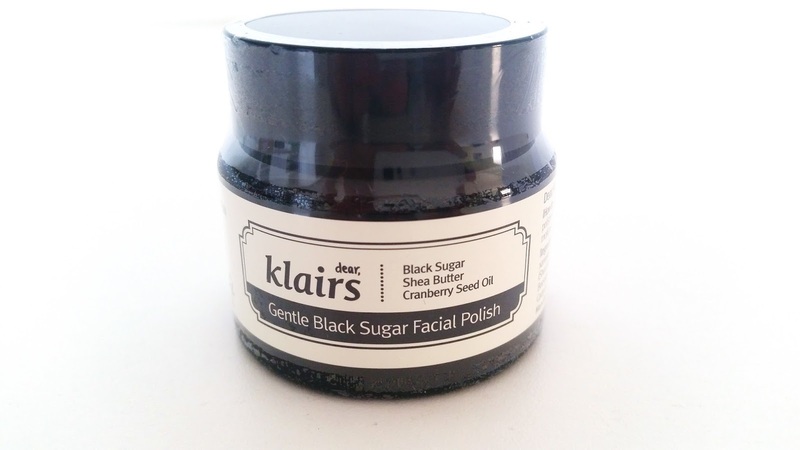 The Klairs Gentle Black Sugar Facial Polish is considered as a physical exfoliator. Whether you choose physical exfoliators or chemical exfoliators will depend on your personal preference and skin type. Some people might find physical exfoliators to be too abrasive for their skin while others love them. Chemical exfoliates aren't perfect either and if you aren't careful with dosage or frequency, you could do more harm to your skin than good. The exfoliation step is often found after the cleansing steps, however, it can also be in-between the cleansing steps as well. Especially for these Klairs cleansing products, it's actually recommended to use the Black Sugar Facial Polish (with a bit of the cleansing oil) in between the 1st and 2nd cleansing steps. This provides deep cleansing of the pores and can help to remove dead skin cells. Alternatively, physical exfoliators can be used on its own as well. However, if it feels too abrasive, try adding some cleansing oil to soften it. Product Description: A facial sugar scrub that works to exfoliate the skin to remove dead skin cells and black heads. The facial polish also has anti-inflammatory properties, can provide some anti-aging care, and help the skin to retain moisture. To Use: Cleanse the face first. Mix a good amount of the facial polish with water or cleansing oil (a 1:2 ratio). Gently massage the mixture onto the skin in circular motions. Rinse thoroughly and follow up with the rest of your routine. Ingredients: Caprylic/Capric Triglyceride, Black Strap Powder, Cetyl Ethylhexanoate, Petrolatum, Glycerin, Tocopheryl Acetate, Butyrospermum Parkii (Shea Butter), Candelilla Wax Esters, Peg-7 Glyceryl Cocoate, Polysorbate 20, Beeswax, Cetyl Alcohol, Glycyrrhiza Glabra (Licorice) Root Powder, Fragrance, Carapa Guaianensis Seed Oil, Vaccinium Macrocarpon (Cranberry) Seed Oil. After cleansing comes the toning step. This is a very important step in a skincare routine as it can help to remove any remaining residues on the skin and prepare your skin for the rest of the products in your skincare routine. There are a ton of different toners on the market and again the one you choose for your skin will be determined by your skin type. The Klairs Supple Preparation Facial Toner in particular is great for those looking for a moisturizing toner that can soothe the skin and balance the skin's pH as well. 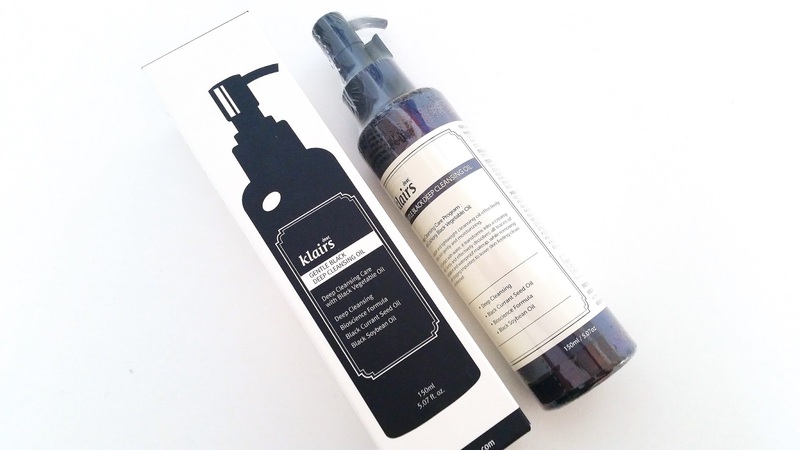 I've review the Klairs Supple Preparation Facial Toner in the past, however, that was the previous formulation of this toner. The toner's new formulation has several changes which I've highlighted in the ingredient list below. It's also lacking some ingredients from the previous version like fragrance and retinyl palmitate, and hydrogenated castor oil. In addition, the current formulation also has 30ml more product per bottle than the previous formulation. Product Description: A hydrating toner that soothes the skin and prepares it for the other products in a skincare routine. It's formulated with various botanical extracts and oils to calm sensitive skin, provide nutrients and hydrate it as well. The toner can also help to balance the skin's pH level and control excess sebum. To Use: After cleansing, apply a decent amount of the toner either by hand or with a cotton pad. Ingredients: Water, Butylene Glycol, Dimethyl Sulfone, Betaine, Caprylic/Capric Triglyceride, Natto Gum, Sodium Hyaluronate, Disodium EDTA, Centella Asiatica Extract, Glycyrrhiza Glabra (Licorice) Root Extract, Polyquaternium-51, Chlorphenesin, Tocopheryl Acetate, Carbomer, Panthenol, Arginine, Luffa Cylindrica Fruit/Leaf/Stem Extract, Beta-Glucan, Althaea Rosea Flower Extract, Aloe Barbadensis Leaf Extract, Hydroxyethylcellulose, Portulaca Oleracea Extract, Lysine HCL, Proline, Sodium Ascorbyl Phosphate, Acetyl Methionine, Theanine, Lavandula Angustifolia (Lavender) Oil, Eucalyptus Globulus Leaf Oil, Pelargonium Graveolens Flower Oil, Citrus Limon (Lemon) Peel Oil, Citrus Aurantium Dulcis (Orange) Peel Oil, Cananga Odorata Flower Oil. Cotton pads always have multiple uses. However, in Asian skincare, they can often be used as a tool to apply toners. Although it's not necessary, it's still very common especially if a toner is used to remove any remaining residues on the skin. Product Description: A box of 120 cotton pads. The box contains 2 types of cotton pads which are the compressed cotton pads and the sponge cotton pads. To Use: Use in conjunction with toners. 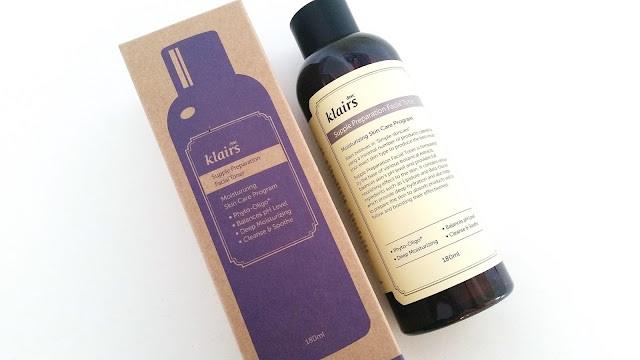 Final Thoughts: This is a great box for those looking to try some of Klair's cleansing and toning products. Or for those looking to stock up on some of their favorites. The price for this box is great (super discounted versus buying product individually) and it offers free shipping and free gift as well. What do you guys think of this box? Would you want to try it? What Brand Boxes would you like to see? Tell us all about it in the comments below! Disclaimer: These products were send to us for review purposes. All opinions are honest and our own. This post contains some affiliate links, for more information check out the full disclaimer.